Our Fillmore car accident lawyers and law firm provide expert personal injury legal services for those injured in auto, motorcycle and other accidents, and for the relatives and families of those killed in car and other accidents for wrongful death claims, in Fillmore, California, a city located in Ventura County, California. If you had a car accident or other personal injury claim in Fillmore, Ventura or anywhere else in California, please contact our Fillmore car accident injury attorneys and legal team now for a completely FREE CONSULTATION. For additional helpful information about Fillmore car accident injury claims, please visit our updated and comprehensive Car Accident Web Site simply by clicking here. Fillmore is a small valley town below the San Cayetano Mountain Peak and is also located within a historic agricultural and tree-farming belt. As of the 2010 United States Census, Fillmore has a population of more than 15,002 residents. Obtain and keep the following in your car or other motor vehicle: Cell telephone, paper and pen or pencil, camera to photograph all involved vehicles, people and scene, flashlight and first aid kit and other emergency gear such as cones and flares. Check everyone involved for any injuries and if anyone needs urgent medical care immediately call 911 for assistance. If the accident is not your fault we advise you to call the police and obtain a police report to confirm same. A Fillmore car accident can cause extremely distressing results with property damage and physical and emotional injury harm for our clients so it is extremely important for those that experience such a terrible accident to have the assistance of one of our professional car accident lawyers as soon as possible. Because of our successful in handling car accident and other personal injury cases in the past 40 years, we have been recognized as PERSONAL INJURY LAW FIRM OF THE YEAR and two of our senior attorneys, Robert Walch and Gary Walch, were each selected as Top Lawyers in California (Highest in Ethical Standards & Professional Excellence). Our skillful attorneys are aggressive in representing your rights and compassionate when it comes to walking you through the process of your devastating accident case. Our car accident experts have handled many thousands of personal injury cases and work determinedly and extremely hard to make the claims process simple and unproblematic for our clients, the victims and their families. 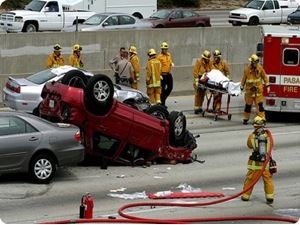 You will find helpful information by visiting our new and updated Car Accident Web Site. An astounding $100,000,000.00 in funds has been recovered by The Walch Law Corporation for its clients; and our firm also offers the victims of car accidents assistance with medical care (regularly without any payment until the case is resolved), specialists, property damage repair and settlement. You can find out more about what our clients have to say about us on our Car Accident Testimonial Pages simply by clicking here. One serious personal injury claim that our attorneys handle is shoulder injury. The shoulder is important for many actions such as pulling, pushing and lifting. The Acromioclavicular, Glenonumeral and Sternoclavicucar are three joints of the shoulder that make its range of motion possible. The functions include rotating the arm, raising it behind and in front of the torso, and making the shoulder move in an entire 360 degree motion. Symptoms of shoulder injury include severe pain, shoulder swelling, shoulder stiffness, bruising and loss of sensation on the hand or arm. Urgent medical care is necessary and fortunately our firm is able to provide names of multiple doctors to treat such problems without any payment in advance. If you or someone you care about suffered any kind of shoulder injury from any car accident or other personal injury accident in Fillmore, Ventura or anywhere in California, please contact our lawyers as soon as possible to receive the representation that you need. The Law Offices of Gary K. Walch provides you the immediate support you need while offering you and the expert advocacy that is vital for you to have when you or a loved one has been through a catastrophic car accident or other personal injury accident in Fillmore, Ventura or anywhere in California. Our job is to stand for your interests while we personally make it our obligation to protect your rights to the highest standard. Our staff handles accidents involving car, motorcycle, truck, bus, train, bicycle, pedestrian, hit and run, uninsured motorist (UM) and much more. Call us for an absolutely FREE consultation to review and analyze your car accident or other personal injury case. For your convenience you don’t even need to leave the comfort of your own home. Just like many of our clients you can do everything by telephone at 818-222-3400 or toll free 866 INJURY 2 (465879 2), email (info@WalchLaw.com) or simply complete our very easy to use contact form.